The T5552-C1 PID Controller Module adds to the T5552 Process Control Learning System to provide microprocessor-based PID control of process control systems. 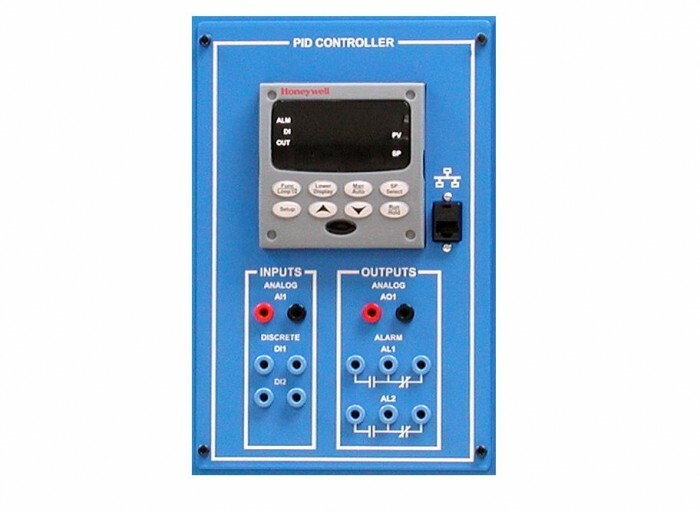 The T5552-C1 consists of a powerful Honeywell PID controller that is mounted and wired to a panel that attaches to the T5552 control panel. The controller includes (2) 4-20 mA analog inputs, (1) 4-20 mA analog outputs, (1) discrete alarm output, and (2) discrete inputs which can be programmed to control processes using any one of three control methods: discrete I/O control, closed loop analog control, or open loop analog control. All I/O connections are made via plug-in jacks which are compatible with the connections on the T5552 System.